My new book Star Myths of the World and how to interpret them: Volume One is the first installment in a series which attempts to provide a comprehensive and systematic guide to the celestial system of metaphor which underlies virtually all of the world's myths, scriptures and sacred traditions. Understanding the way this system works -- learning the celestial language in which the sacred stories of humanity are composed, all around the globe -- allows us to see actual evidence to support the assertion that all the ancient traditions are actually closely related on a very fundamental level, and that the stories found in the Bible or in the ancient myths of Egypt, Greece, China, Japan, India or Sumer, and those found among the indigenous people of Australia, Africa, the Americas, or the islands of the Pacific, are all just different ways of allegorizing the same celestial actors and the same majestic heavenly cycles. But this evidence would be very difficult to see, and the celestial language would be extremely difficult to learn, had it not been for the efforts of the well-known author and illustrator H. A. Rey, creator (along with his wife Margret Rey) of the Curious George series of stories, who shared his abundant love for the stars and constellations in two wonderful books which remain in print to this day: Find the Constellations (first published in 1954 according to the inscription in the edition I saw, and designed primarily for younger readers), and The Stars: A New Way to See Them (first published in 1952), which is simply the best introductory guide to the night sky imaginable, in my opinion. The importance of these two books (particularly the second one) and of the system which Rey introduces in these books for envisioning the constellations of our night sky simply cannot be overstated. Without Rey's outlines, unlocking the celestial metaphors which can be found in virtually every body of mythology and sacred tradition from around the world would be exponentially more difficult. With his outlines, the celestial metaphors fairly leap out of the stories, once we become familiar with the constellations and their characteristics, and the ways that the various heavenly actors are usually employed in the different character roles of the world's sacred texts and stories. Look at the illustrations in the top image for a moment, and imagine yourself out on a walk through the night, looking at the sky and trying to find the constellations. The outlines provided are virtually useless: they are very difficult to remember, they bear almost no resemblance to the actual fish, animals, or people that the constellations purport to represent, and because of this they would be almost no help in actually seeing the constellation if you were out on a walk, no matter how hard you tried. In fact, the typical non-Rey outlines are so atrocious that it makes one seriously wonder if whoever came up with the modern outlines was taking an almost perverse pleasure in seeing how unlike a fish or a whale or a charioteer or the hero Perseus they could make the lines connecting the stars of these constellations look: if they were deliberately distorting the outlines in order to avoid revealing the fish or the whale or the charioteer or the hero that the ancients must have seen when they named those constellations in the first place. 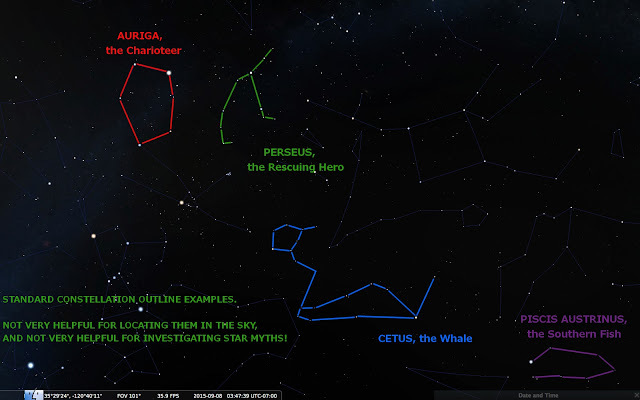 Because not only do the typical modern outlines make the constellations unnecessarily difficult to envision, remember, or actually locate on your own: they also (whether deliberately or not) leave out some of the most important mythological characteristics of the constellations -- the characteristics which help reveal which mythological character or event relates to which constellation in the sky. 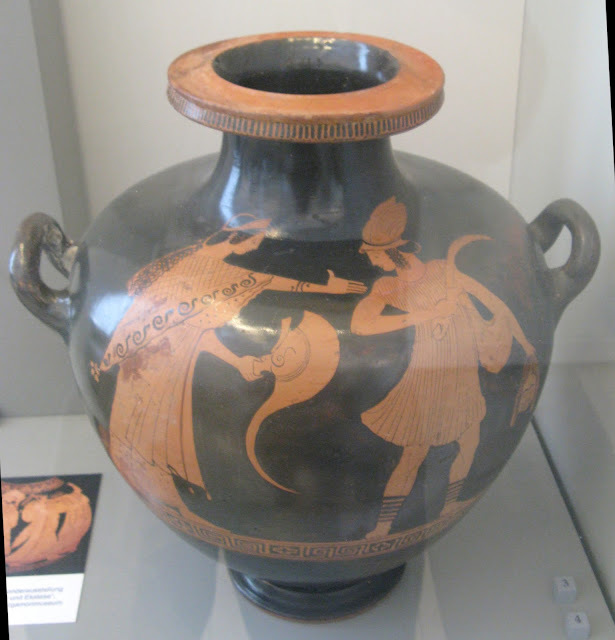 For instance, in the outline of Perseus shown in the top diagram, the peaked cap of the hero is omitted altogether -- and yet this cap is a very important feature of the constellation, and one that helped Professor David Ulansey determine that the figure of Mithras found in the central "tauroctony" painting or bas-relief in every single surviving mithraeum is an allegorized representation of the celestial figure of Perseus, an argument which completely overturned much of the academic scholarship on Mithraism of previous decades going back nearly a hundred years, and which you can read about in Professor Ulansey's book Origins of the Mithraic Mysteries (1989). Additionally, the standard "non-H. A. Rey" outline of Perseus in the top diagram does not even include the "right arm" of the outline of the hero (the one on the left as we look at the star chart). This arm ends in a very distinctive "curled" shape, which is featured in a great many different myths around the world -- including, I believe (following the pioneering analysis of the great "astronomico-theologist" Robert Taylor from the early 1800s) the story of Adam and Eve and their expulsion from the Garden of Eden. As discussed very briefly in this video I made last year entitled "Star Myths: 1,000 times more precious . . .", when the serpent and Eve and Adam are successively expelled from Paradise into "the dust from whence they came" (when their constellations sink down out of the sky and disappear belowthe western horizon), the constellation of Perseus is rising up out of the eastern horizon: he is the angel (or the plural Cherubims: single constellations sometimes appear in myths in plural form) placed "at the east of Eden" spoken of in Genesis 3:24. The same verse describes "a flaming sword which turned every way, to keep the way of the tree of life." Because it is very likely that the angel placed at the east of Eden is played by Perseus, and because Perseus has that distinctive almost-circular aspect to one of his two hands, I believe it is very likely that this characteristic of the constellation is connected to the description of the sword which "turns every way" in the Biblical text: the text is giving us an additional clue in order to help us to understand that it is talking about the constellation Perseus. 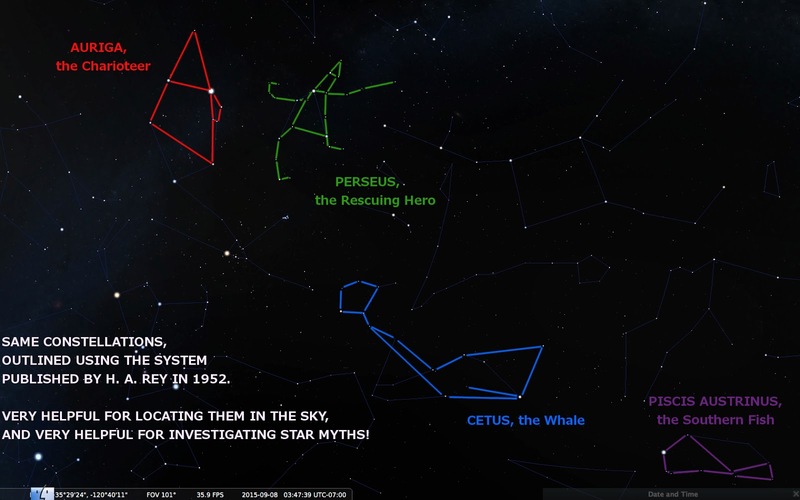 But you would not have had an easy time discovering any of those connections if you were using the conventional and completely non-sensical constellation outlines presented for the constellation Perseus, instead of the inspired outlines presented by H. A. Rey in his books from the 1950s. I happen to have grown up with the outlines of H. A. Rey, thanks to my father who bought both of the above-mentioned books for the family when I was so young that I don't remember ever not having access to Rey's system of finding the constellations, and his illustrations suggesting the most natural way to envision them. 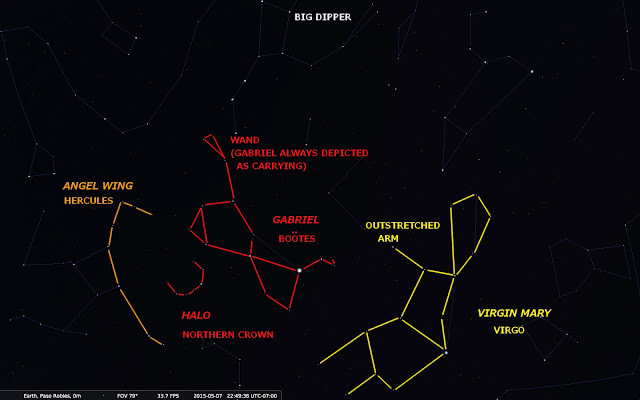 Once again, it is almost useless for actually trying to envision a Herdsman (how does one get a Herdsman from that oddly-shaped kite-looking figure, one might wonder), and thus it is very difficult to remember or to use as an outline for actually locating this constellation in the night sky. But even more problematic is the fact that the above method of outlining Bootes completely obscures his most important mythological characteristics: the fact that Bootes appears to be either patiently sitting or kneeling, with a very tranquil, almost distracted air, and the even more important fact that Bootes has a very distinctive "pipe" rising up from his mouth, ending in a kind of triangular shape. That previous post discussing the celestial aspects of this episode from the New Testament showed evidence that the "pipe" of Bootes functions as the wand which is invariably depicted in paintings of the angel Gabriel going back for hundreds of years -- and functions as well as the flute carried by the Lord Krishna in the sacred scriptures of ancient India. 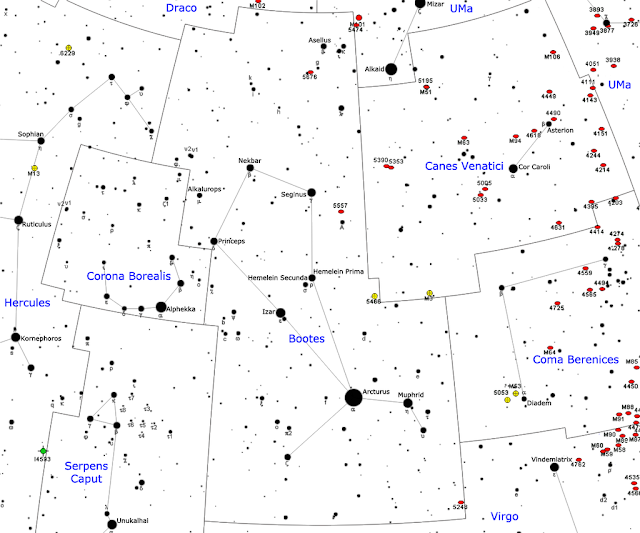 But once again, you would probably have a very hard time figuring any of that out using the conventional outline often presented for the constellation Bootes. Thankfully, the constellation diagrams of H. A. Rey not only provide the most intuitive way to envision, remember, and find the constellations of our night sky: they also match up remarkably well with the characteristics that pop up again and again, across cultures and across the oceans and even across the millennia, in the myths and sacred traditions of the human race. In fact, the level of correspondence is absolutely uncanny, and causes one to wonder just how much Rey himself knew about the connection between the stars and the ancient myths. 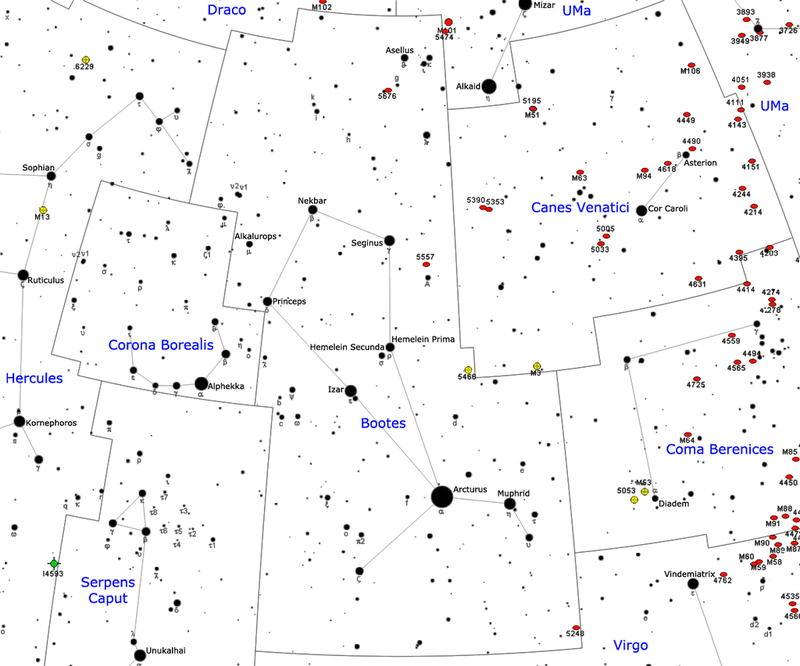 We should all be thankful that, whatever his understanding of such a connection (if any), and however he came up with his system, H. A. Rey shared his system of outlining the constellations with the world. Few people can tell one star from another. Most of us can tell an oak from a maple or a jay from a woodpecker even though we don't see woodpeckers often, but the stars, which we see any clear night, remain a mystery to us. Yet it is not difficult to know them. 3. Becoming familiar with the stars does take some time and effort -- the best way to proceed in my opinion is to do so slowly, with the goal of learning just one or two new constellations a week and then going out to locate them on many successive nights. If at all possible, making a habit of going for a walk at a similar time each evening (or early morning, well before sunrise) in a location with a reasonably dark sky and a fairly unobstructed skyline will help you to begin to understand which constellations are in the sky during which times of the year, and to watch as they move further west at the same time each successive night, and new ones cycle into view from the east. 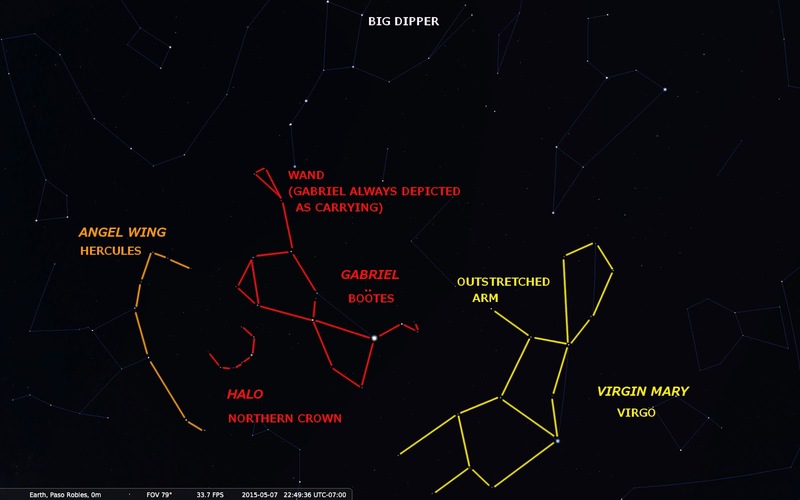 If you can make this nightly walk follow a circuit that gives you a view of all the different directions (all the different "horizons" in all directions) during different parts of the walk, that will also be extremely beneficial and will help you slowly build up your "vocabulary" of constellations with which you are familiar, a little at a time. But, thanks to H. A. Rey and the system he outlined, you can and will build up familiarity that will be absolutely invaluable to understanding the celestial language of the myths and sacred scriptures of the world. That language will enable you to actually see the abundant evidence that supports what many have suspected regarding the fundamental connection of all the world's ancient wisdom, across the different cultures and continents of our planet. Even more importantly, knowing their celestial language will enable you to converse with the myths for yourself, in order to learn what they may be wanting to tell you. Welcome new friends from Grimerica!